Home / Adaptation / Hannibal / NBC / Reviews / TV / [Review] - Hannibal, Season 2 Episode 5, "Mukōzuke"
[Review] - Hannibal, Season 2 Episode 5, "Mukōzuke"
The word that kept coming to mind as I watched this episode of Hannibal was "disingenuous." This episode was a lot of things, and covered a lot of ground, but it kept coming back to explanations, and those explanations never felt true. It was the first time since the series began that certain elements have felt forced. That the characters were being manipulated by an unseen hand and not Hannibal's, but that of the writers. That's not to say it wasn't good. As Fuller and the writers have shown, even the worst episode of Hannibal is quality television. It was just underwhelming considering the way things ended last week, and confusing in terms of what has come before, and distracting in terms of what comes next. And while there were several elements at play, and plenty of story to go around (it amazes me every week that they seem to be able to cram a feature length amount of content into 42 minutes), none of it really sat comfortably at the same table together. Hit the jump for the review, which contains spoilers that often play "find the liver" when they are bored. Oh Bev. I expected something terrible to happen to you. I didn't expect something terrible to happen to you. But I question why Hannibal had to be so showy with her. By dissecting her, by placing her in the same location of Abel Gideon's attack on Chilton, the place where Miriam Lass' arm was discovered, he's broadcasting to the world that it is the work of the Chesapeake Ripper. He's openly mocking Jack, and he's all but provided the defense with proof that Will is innocent. Why reveal himself? 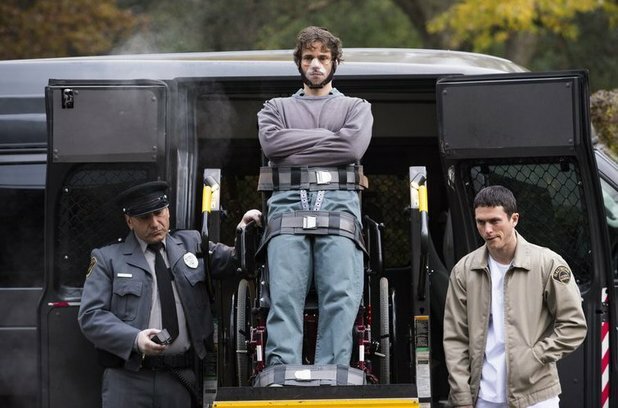 I understand that Hannibal is on the road to being caught, but in the present why does he seem fit to make it easier for everyone? On top of that, he knows that it will only ignite Will 's claims against him again, with all the more ferocity considering that Will essentially lead her into the lion's den. I understand that Bev put him in an awkward position, her finding his lair like she did, but why not eat away at her over time, rather than put her on display? This week saw the proper return (after being glimpsed in memory last week) of Eddie Izzard's Dr. Gideon, the show's version of the film version of Lecter. I'm not complaining, Izzard was wonderful last year, and Gideon is one of my favourite characters from this series. But his survival from last year's apparent head wound is completely glazed over with an off the cuff "Will isn't as good a shot as he thinks." In a show this continuity heavy, you'd have thought that Gideon's survival would have been mentioned before now. In relation to Chilton, in relation to Will's trial, or as an obsession of Hannibal's, who does not allow people who know his identity to survive. His sudden reappearance smacks of accommodation. Of dearly wanting to have Izzard back on the program, a desire I can fully understand. But death has not stopped other characters from returning. In a mind as racked with guilt as Will's, the dead are a regular feature. The dead, however, can only reiterate. They can't provide any new information, but neither did Gideon. He has preserved his continued survival by playing along with Hannibal, though to what end is yet to be seen. Is it as simple as one animal deferring to the alpha of the group? Chilton seems to be playing his own game with Hannibal, which is equally interesting. He already has Hannibal pegged as being professionally corrupt, though not as corrupt and nowhere near as incompetent as himself. He has no reason to believe Will's assertions, yet seems to be playing along with them. Has he been convinced of Will's innocence, and is willing to play the game through until the Ripper reveals himself, or is this all just posturing for Will's sake. He's certainly hiding behind the idea of Will's therapy, but that mask isn't going to protect him for long. To Will's credit, he seemed at first to have acknowledged that screaming "Hannibal did it!" at everyone who passes by his bars wasn't working, and since bodies keep piling up, it might be better to let people work it out for themselves. It worked wonders for Bev. Once the grief of Bev had turned him cold, and the uncooperativeness of Gideon left him empty, Will decided to reach out to the copycat. And here, I'll admit, the show lost me. A few weeks ago, during the trail, claims were made of a copycat killer. At the time, I assumed that Hannibal was the killer. He was certainly the only one who could have produced Abigail's ear, and the flourish was the same. I expected his own assertion that it was a copycat as deflection from himself, and the slight change in the MO his way of taking some of the heat off of Will without completely erasing all doubt of his guilt. Then the judge was killed with such style, and it was attributed to the copycat as well, and I thought there we have it. Will's reaching out to the copycat, I assumed, was his way of trying to draw Hannibal into something of a public confrontation, so that Jack might gaze upon his true form in clarity. Instead, it is revealed that there really was a copycat. Hannibal killed the judge, but the bailiff was the work of a disturbed individual who took to idolizing Will. Again, this seems like the writers changing the narrative to fit an idea, rather than structuring the narrative to develop the idea. At the very least, considering that the asylum has become the show's second home, a bit of foreshadowing with the orderly should have been in order. To have seen him at least once before would have been nice. Will orders his new best friend to kill Hannibal, and this is what is truly interesting about the episode. Between Hannibal and Gideon, Will is surrounded with examples of people crossing the line and getting what they want. The allure for crossing over has never been stronger, and from the jail cell (or behind the iconic straightjacket and mask), there certainly isn't a greater threat of repercussion. Every character with half a thought has said from day one that Will is a step away from being the monster they are currently accusing him of. Killing Hannibal, even by proxy, would apparently send him over the edge. The final scene, of Hannibal's crucifixion, was interesting visually, but I don't know what it adds. There is a narrative connection to the Bible-heavy third novel, Hannibal, but beyond that it lead no where. The copycat is killed, Hannibal is shown in a moment of weakness, and his innocence in the eyes of Jack is reaffirmed. Really, at this point, if they are just building up Hannibal more and more in Jack's eyes, so that his betrayal will hit that much harder, why does it have to come at the expense of sensible storytelling? I just wanted to add, the orderly was actually shown several times in precious episodes but almost like a background character, so he didn't come out of nowhere per se. A lot of people actually predicted he would be the admirer. I personally really enjoyed the 'crucifixion' scene because of the irony it provides (a Satan figure strung up like Jesus) as well as another interesting look at Hannibal's character. And as you said, it's possibly going to drive Jack and Alana even closer to him after seeing his brush with death like that, so it's definitely an important plot point. It represents Will's 'fall' too, of course. He had murderous intent for the first time. From digging around the internet, it looks like my opinon of this episode run heavily counter to how others felt about it. Many are calling it the best of the series thus far. I'll cop to not noticing the orderly (maybe I've been distracted by the lack of Barney), but I'll stand by my opinion. I was very impressed with the sound editting in this episode: the thawing of the ice at the start, the dripping of the tap at the end. The visuals were, as always, stunning and the episode looked beautiful. I was just a little let down by the script. Either way, the episode gets Izzard points.